Diasporic Self: Black Togetherness as Lingua Franca is a collaborative project/’exhibition’ initiated by researcher and curator Amal Alhaag and artist and curator Barby Asante. On view at Framer Framed from 14 December 2018 – 17 February 2019 and from 7 december – 25 januari at 198 Contemporary Arts & Learning in London. Artists: Ajamu, Lydienne Albertoe, Jabu Arnell, Nadeem Din-Gabisi, Afaina de Jong & Inna Vision, Anne Krul, Silvia Martes, Nástio Mosquito, Pascale Obolo. 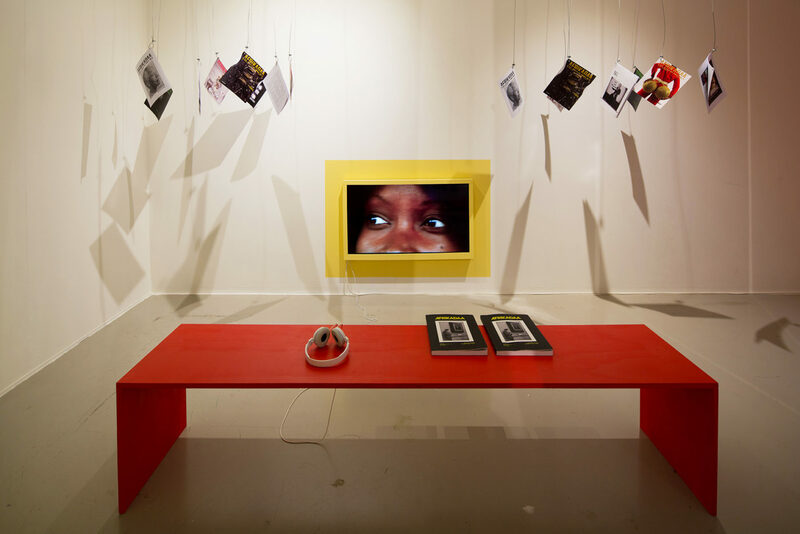 Diasporic Self is an ongoing visual, sonic and dialogic programme and exhibition environment that looks into the meaning, conceptualisation, multiplicities and complexities of the notion of Black Togetherness across Europe. In what ways does Black Togetherness manifest itself in visual and sonic cultures in various urban and contested spaces, institutions and architectures? The project takes place in two spaces simultaneously – Framer Framed in Amsterdam and 198 Contemporary Arts & Learning in London. Central to the project are the historical and contemporary relationships, codes and ‘lingua franca’ that are transmitted between various diasporic (artistic) communities. Diasporic Self shows how art practices are guiding, (un)doing and documenting the ways memories, presences, togetherness and production within, and outside of the confinement of black diaspora are continuously (re)shaping the alternative lexicons that influence contemporary black cultures across Europe. Subverting the notion of the ‘exhibition’, Diasporic Self departed from the question: how can we come up with new, decolonial forms of narrating black visual and sonic culture spatially? Architects Afaina de Jong & Inna Vision designed an architectural living space for everyday vernacular, performances, radio, translations and improvisations. 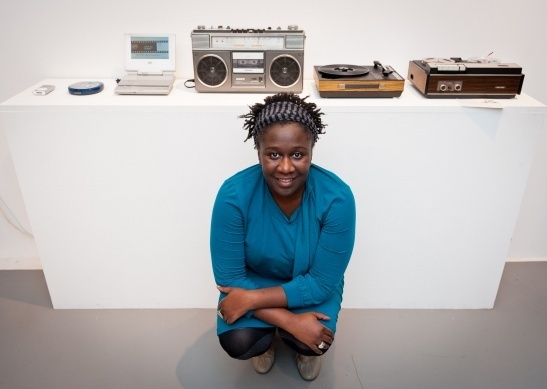 Black artists, thinkers, poets and strangers come together to look into and work with unconstituted archives and informal memory practices that inform, characterise and map contemporary black cultures in Europe. How are they re-collecting, re-fusing and re-defining the terms and conditions of engagement with(in) and across urban space, borders, histories, societies and institutions? These questions are addressed in a variety of (artistic) forms. In the surrealistic film installation, for example, artist Nástio Mosquito questions the colonial gaze and the existing imperialist legacy. 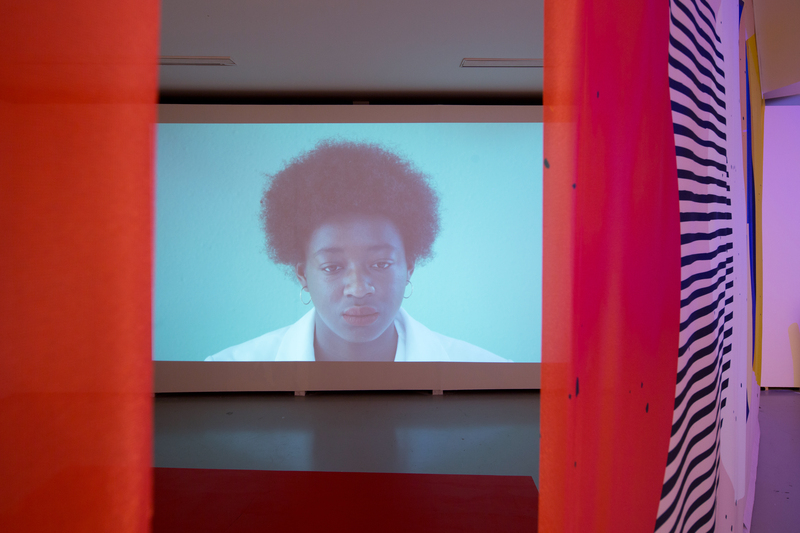 Artists and filmmakers Silvia Martes and Pascale Obolo, in their respective works Terra Incognita and La Femme Invisible, both stress the complex multiplicity between history, agency and the black female reality. In the joyful film blk boy flight (me & my cousins), Nadeem Din-Gabisi shows that there are other sides to the black boy/man/child than are predominantly shown. Diasporic Self: Black Togetherness as Lingua Franca will infiltrate Framer Framed, transforming the frameworks, functions and structures of the space without displacing its everyday activities. 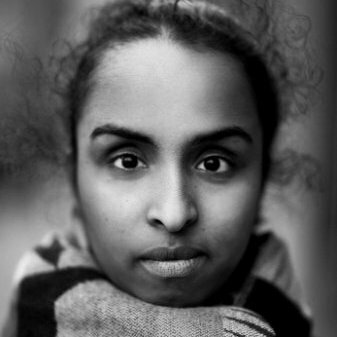 Drawing together myriad voices from across Europe, the project takes many forms, operating as an innovative platform for (un)doing, memories, presences and togetherness about Diasporic communities, by Diasporic selves. What is the interrelationship between the living ‘lingua franca’, and the practices and daily realities of black artists, activists and cultural producers in Europe? Dipsaus, thé Dutch podcast for and by women of colour, just featured a bonus episode on the exhibition! Olave Nduwanje spoke to initiators Amal Alhaag and Barby Asante. On black togetherness, its precarity, the tropes around representations of blackness, archiving, and much more… the interview is available in both written form (Dutch) & podcast form (English)!